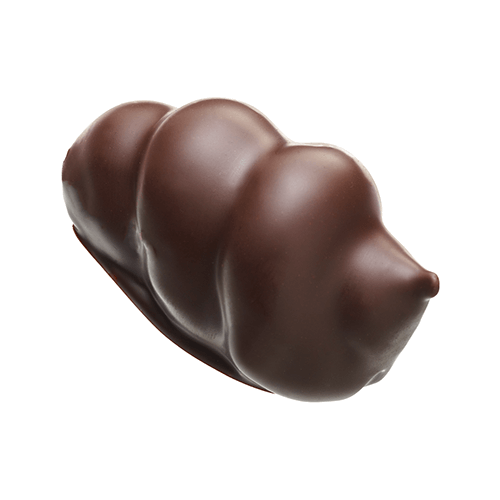 A ganache based on Figs, cream and milk chocolate wrapped in a blanket of Lübecker marzipan and enrobed with dark chocolate. 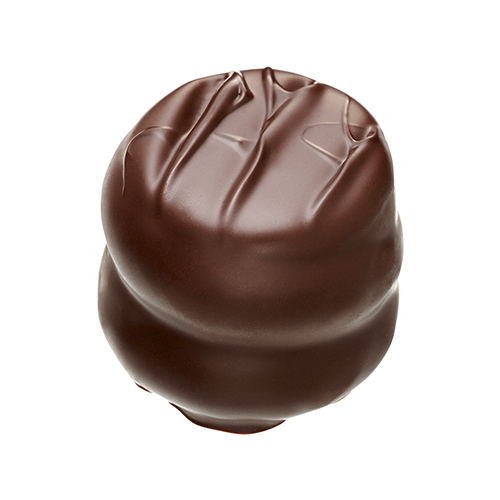 The combination of powerful marzipan and ripe figs gives the chocolate an air of indulgence that is only matched by its honey-like sweetness, roasted almond punch and delicate shape. 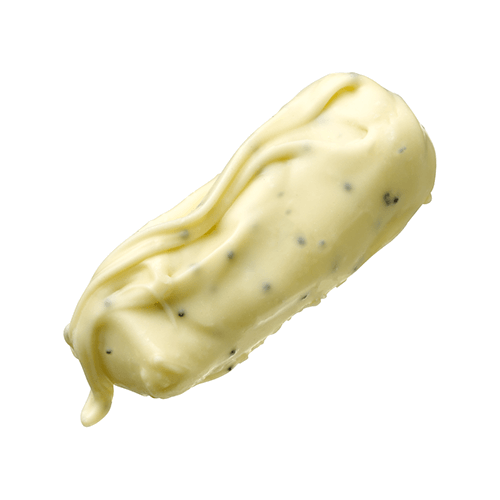 The interior consists of vanilla, white chocolate and cream which is enrobed with white chocolate mingled with poppyseeds. 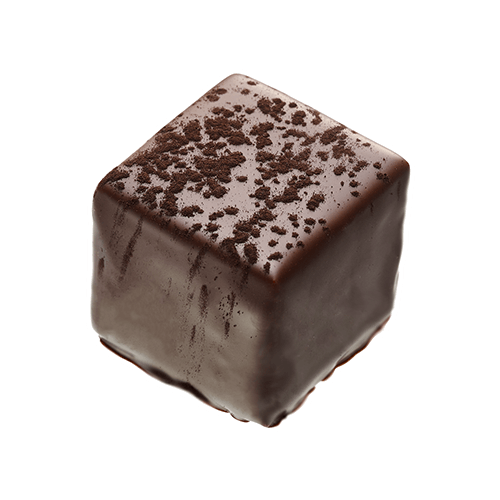 The only bonbon consisting entirely of white chocolate presents a tantalizing aesthetic and robust sweetness that contains strong tones of vanilla and finishes off with a curiously rough poppyseed texture. Roasted sesame paired with milk chocolate and cream enrobed with dark chocolate. The roasted sesame adds a subtle nutty taste to the creamy ganache with subtle sugar crunches which finds itself surrounded by the fruity tones of dark chocolate. By pairing the taste and structure of rhubarb with white chocolate, a delicious ganache emerges which is enrobed with dark chocolate and topped with black cocoa. The combination of rhubarb and white chocolate creates cascading waves of tart and sweet flavours that are complimented by the robust body of dark chocolate and bitter black cocoa, which leaves you with a surprisingly refreshing taste. Plums combined with extra dark chocolate and cream enrobed with dark chocolate and decorated with dark chocolate splitters. 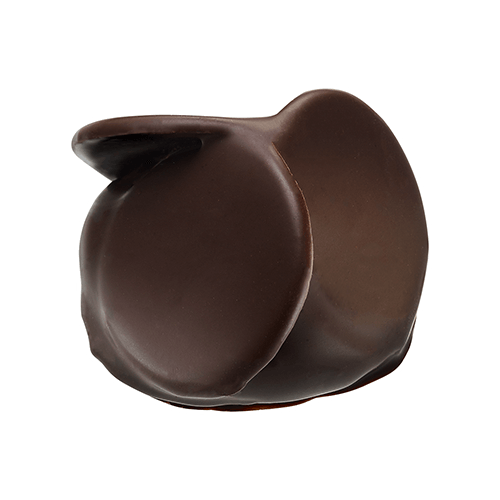 The robust sweetness and acidity of the plum is sealed in its extra dark chocolate shell but explodes with an intense fruity flavour on your first bite, while the splitters add variation to the otherwise smooth texture. Healthy honey roasted pecan nuts, cream and milk chocolate, which is used both in the ganache as well as for enrobing the exterior. 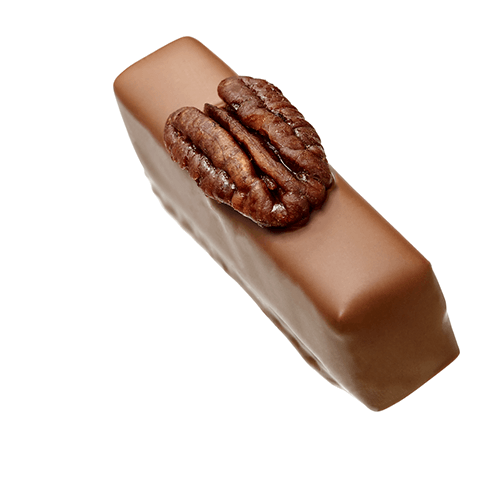 The seamless exterior houses a brilliant creamy ganache with hidden miniature chunks of roasted pecan nuts that add depth to the bonbons taste and texture. It is topped with a beautiful candied pecan that resembles a crown jewel. 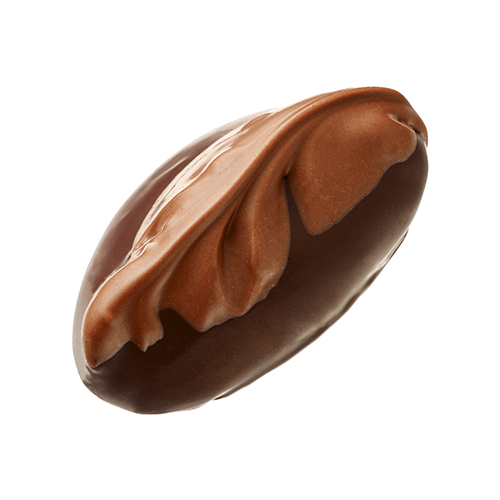 The spice nutmeg is combined with milk and dark chocolate and cream to form an adventurous ganache that is enrobed with dark chocolate. Nutmeg is traditionally considered a sweet spice, but the piquant flavours are brought to the surface to form a beautiful sweet-spicy chocolate that is only matched by its incredible hand-piped aesthetic. 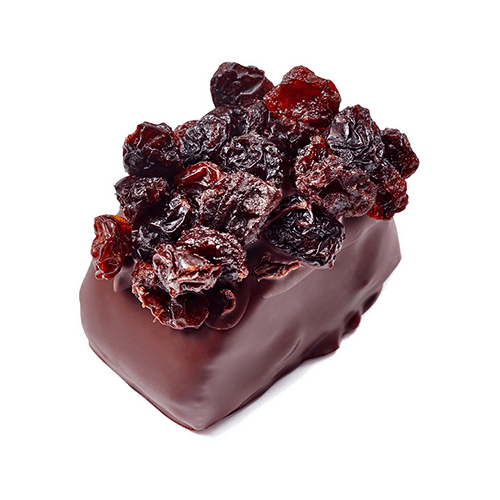 Lübecker marzipan merged with currants and enrobed with dark chocolate and decorated with currants. An incredibly diverse flavour profile, with strong hints of fruity acidity and almonds is produced by the combination of marzipan and dried currants, which is bolstered by the decorative, gemstone currants. 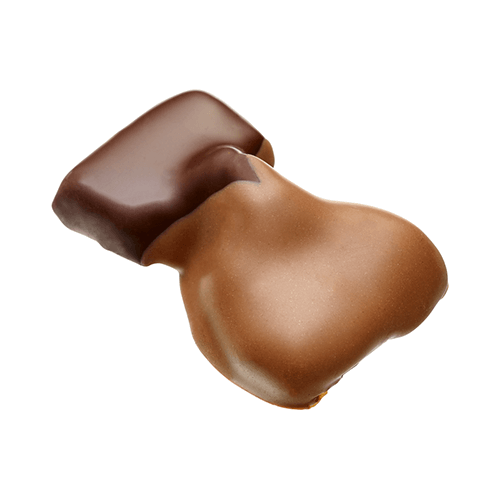 Lübecker marzipan and dried apricots covered in dark chocolate and then dipped in milk chocolate. 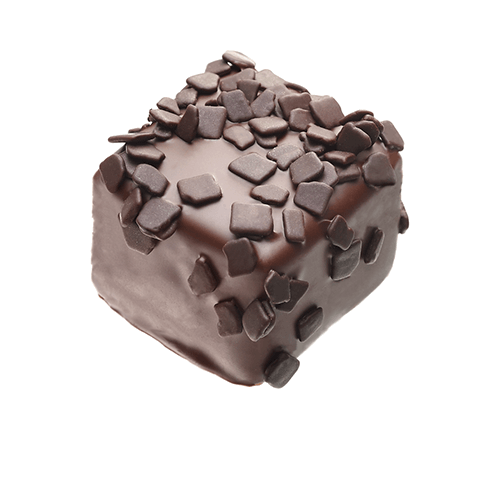 Coffee, cream and dark chocolate coats the bonbon on both the inside and outside. 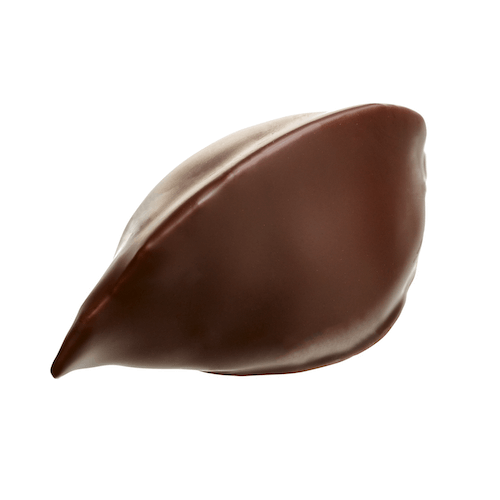 Finely ground coffee beans provide a full body and pure coffee taste complimented by the dark chocolate and mind-bending shape. Gianduja is a mix of chocolate and hazelnuts. 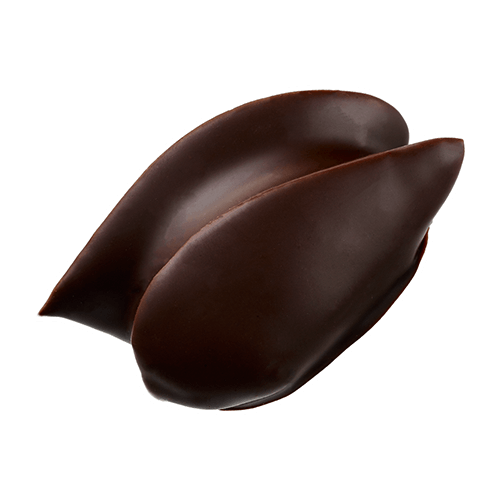 This ganache is enrobed in 54% dark chocolate and dipped in 33% milk chocolate. 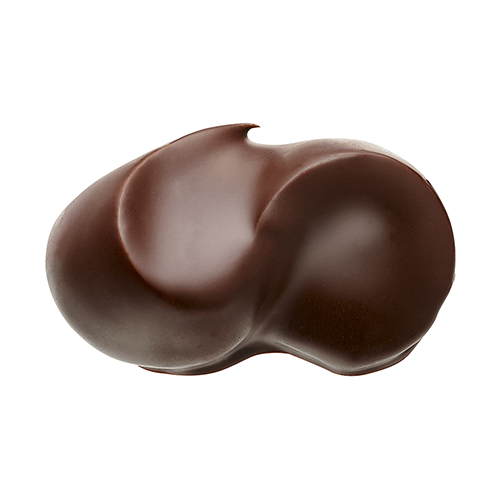 The thick hazelnut ganache and various chocolates compete for the palates full attention before merging perfectly into a fragrant, nutty mix anyone can relish. Drambuie is a liquor made from whiskey, herbs and honey. This is combined with milk chocolate, hazelnuts and cream into a ganache. This ganache is then enrobed with dark chocolate. The airy ganache meets its perfect chocolate counterpart in the dark chocolate that sits on the outside, creating an exciting blend of flavors and textures. 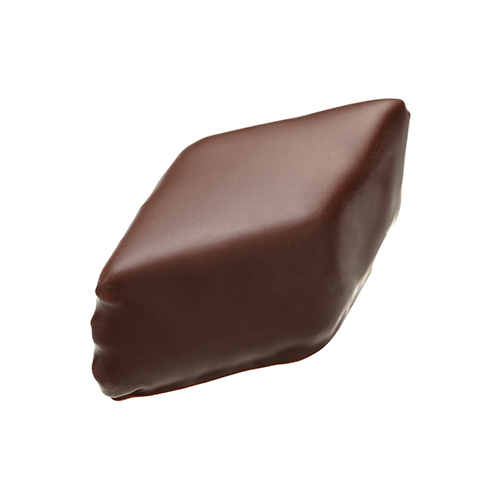 The ganache of this bonbon consists out of the highest quality South Asian ginger together with cream and dark chocolate which is also used to enrobe the ganache. The ordinarily hot and zesty bite of the ginger is balanced by the dark chocolate to enrich the gingers natural sweetness and warmth. This ginger is as aromatic as it is flavourful. 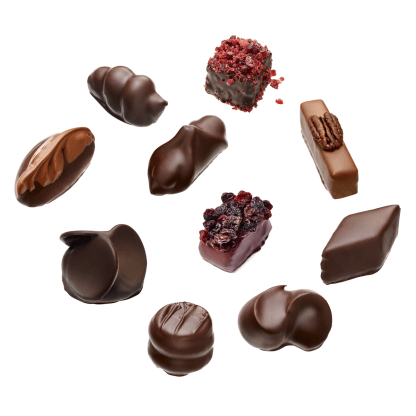 The vitamin rich cranberry provides a fresh, sweet taste which perfectly pairs with the dark chocolate which is used both inside the ganache as well as for the exterior. 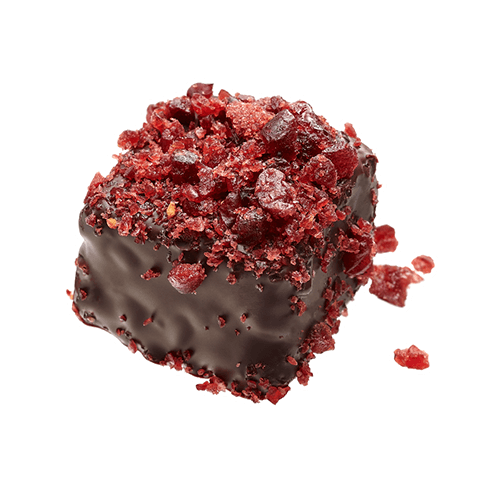 A field of cranberry lies on top of the elegant dark chocolate coating and provides a distinct refreshing acidity and crunch that can only be attained with dried cranberries, while the smooth ganache balances both taste and texture. 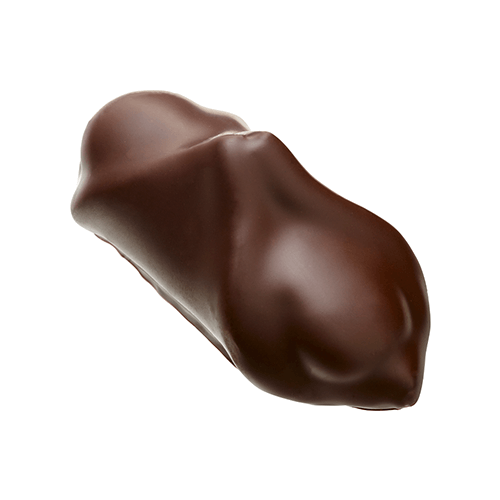 A combination of extra dark chocolate, raisins, cream and cognac enrobed in dark chocolate. The Cognac releases a fragrant, fiery flavour almost immediately as it touches the palate, while the extra dark chocolate, cream and raisins provide the perfect cooling refreshment with a surprising crunchy effect from the figs. Cointreau is an orange liquor. This combined with cream and dark chocolate brings a surprisingly fresh, zesty orange to the palate producing a mouth-watering effect that permeates throughout the bonbon into the ganache; and is topped off with the beautiful design representing the different layers of flavors.